The Nagaland Board of School Education (NBSE) is responsible for the declaration of Nagaland Board 10th Result 2019. The Nagaland Board 10th 2019 result will be declared by the third week of May tentatively. NBSE will publish the Nagaland Board Class 10 2019 result online on their official website after it is formally announced. Students can finally access the outcome of their hard work without any hassles. A live link to check the Nagaland Board 10th result 2019 will be made available here on this page of our website. Students must, therefore, visit this page on a regular basis to stay updated on all the relevant information about Nagaland Board Class 10 result 2019. We advise the students to bookmark this page so that all the information is easily accessible. The officials have released the timetable for Nagaland Class 10 Board exams. However, any information about Nagaland Board result 2019 has not yet been released. Taking cue from the previous trends of the Nagaland Board, the NBSE HSLC Result for Class 10 students is likely to be released during the first or second week of May. JagranJosh is in close association with the Nagaland Board and any information about the declaration date of Nagaland Board 10th result 2019 will be immediately made available here. 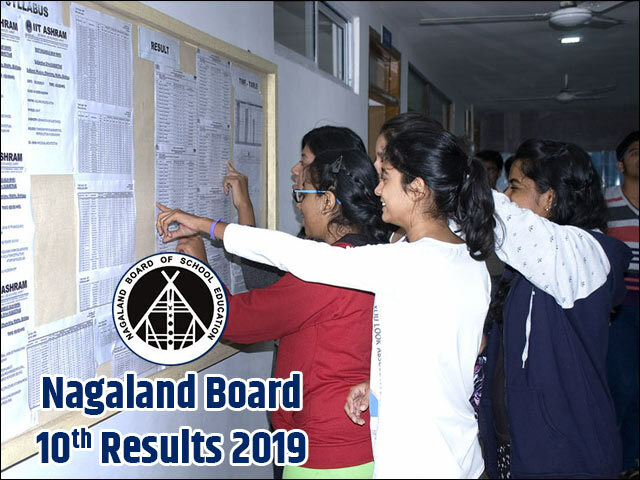 Once announced by the Nagaland Board, the NBSE Result 2019 can be checked online through this page of jagranjosh.com. For more information on NBSE Results, the online checking procedure and other aspects related to NBSE 10th Result 2019, please read further. Nagaland Board Class 10 Result 2019: Where to Check? Once announced, the Nagaland 10th Result 2019 will be available on this page of our website. The students will be able to check their NBSE Results very easily without any problems or delay. But, until then to keep track of latest updates and news about NBSE 10th Result 2019, please bookmark this page and visit it regularly. Alternatively, you can also subscribe to email alerts of Nagaland 10th Results by providing your mobile number and email id in the form provided on this page. This will ensure that the process of checking the Nagaland Board Class 10 2019 result is smooth for the students. To help the students in understanding the marking pattern of the NBSE, we have accumulated previous year's data. In order to take pressure off the students and to help them to set realistic expectations, we have provided the analysis of Nagaland Board Class 10 2019 result below.Let us see the past year passing percentage of Nagaland Board students. The Nagaland Board of Secondary Education is hopeful that the NBSE Class 10 result 2019 will be better than the previous year. So, students work hard and give best in the Nagaland Board Exam 2019. How to Check Nagaland Board 10th Result 2019? Soon after the completion of the Nagaland Board exams the rumour mills will spare not time in churning out speculations and students are often left in confusion when it comes to matters such as exams and results. To quell such speculations, we would be providing regular, timely and verified news and updates about the NBSE HSLC Results on this page. Our team at JagranJosh will provide regular updates about Nagaland Board Class 10 result 2019 after verifying the same with the board officials. Alternatively, you can also register for the email alerts service under which our team will share the latest updates about Nagaland Board 10th Results 2019 with you directly in your email inbox. To start receiving these alerts from today, you can submit your mobile number and email id in the form provided, at the top of this page. What after Nagaland Board 10th Result 2019? After checking your Nagaland Board Class 10 result 2019 thoroughly, students should download the scorecard for future reference. The result of Nagaland Board 2019 10th result will be available on the official website of NBSE and can also be accessed from the links provided above. The downloaded copy of marksheet displayed in Nagaland Board Class 10 result 2019 will act as a provisional status until the original marksheet is provided by the school authorities. Students must mandatorily collect their Nagaland Board 10th result 2019 marksheet from their respective schools as it will be required for the official purposes during admission to higher courses of study. The declaration of Nagaland Board 10th result 2019 may not be a moment of joy for all. If students, at any point, feel that the marks obtained by them are not right then they can opt for the re-checking or re-evaluation of the answer sheets. For this, you can submit an application at the NBSE along with a nominal amount of fees. Any changes in the final mark tally of Nagaland Board Class 10 result 2019 will be updated in the original marksheet of the students. Unfortunately certain students may also fail in the Nagaland Board exam 2019. For such students, there is an option of appearing in the supplementary exam conducted by the NBSE. Students can appear in the supplementary/improvement exam of Nagaland board by filling in the application form that will be made available on the official website of NBSE 10th 2019. The Nagaland Board supplementary examination 2019 will be held in the month of June. The Nagaland Legislative Assembly passed an Act to set up the Nagaland Board of Secondary Education. On October 1, 1974, the NBSE started the formal operations from Kohima office. The NBSE Board also conducts a wide range of seminars, programs, cultural activities etc. The first HSLC Exam was conducted in March 1975. Over the many years, the organisation marked a significant development with the HSLC examination. Recently, they also introduced the central coded answer books. Every year, the board organises the annual High School Leaving Certificate (HSLC) exam for Class 10 students and the Higher Secondary School Leaving Certificate (HSSLC) exam for Class 12 students.